Family Tips: How to Communicate with Your Teenagers? This is probably one of a parent’s hardest jobs, and one that most dread for most of their lives; teenagers. This is that time in children’s lives where they are discovering who they are, trying to find their place in the world, and creating opinions and beliefs about the true nature of the real world. This is also a very delicate time in their lives, even though this may be the first time that they are as big as you, if not bigger, and delicate doesn’t see the right word. As teenagers face peer pressure, hormones and emotions, and a change in the way they interpret and create relationships, they need more support from you than ever. However, parents end up making all the wrong moves, and saying all of the wrong things, regardless of their best efforts, and their teenagers pull away from them instead of pulling closer. Sometimes it’s hard to remember what it was truly like to be a teenager, and so we simply hold strong to what we are told by everyone else. 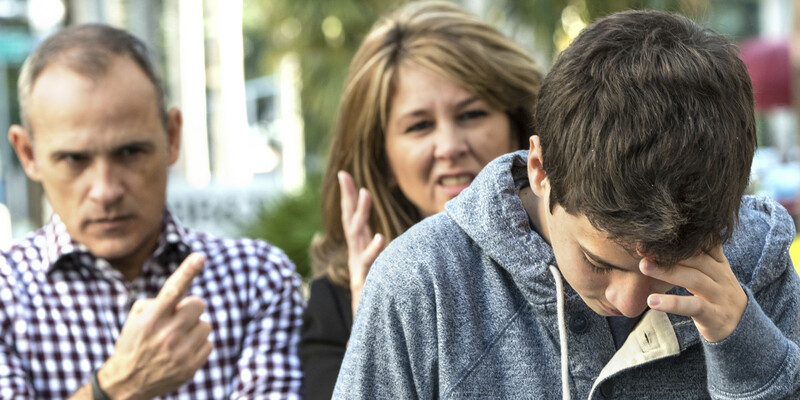 Teenagers are dangerous, destructive, disrespectful, and need to be disciplined at every chance. You are told that to control them, you need to show them who’s boss and force them to bend to your will. When in fact, all of the advice you are given in regards to your teenagers is exactly what is pushing them away from you. These teenagers are individuals striking it out on their own, trying to find their place in the world, and without a strong foundation at home to support them, encourage them, and teach them, they have to figure it out by themselves. By giving them the strength at home that they need, you are really giving them a shoulder to lean on, a place to escape their fears, and somewhere to come back to for advice and regrouping when they make mistakes. Mistakes are inevitable, but what a teenager truly needs the most is someone to love them, put them back on their feet again, and send them back out there. What’s difficult for most people to understand is that children, no matter what their age, think just like adults do. They may not have had the experience, or the education, but they think, and feel, and react just like any other human being. The only difference is that your treatment of them is teaching them what everybody is like and how everybody feels about them, therefore they are even more heart-broken when their hopes are dashed, not yet callous from the world. Every child deserves the same respect from adults that they expect from children. They want to be treated like they understand, like they have control over their actions, and like they can make their own decisions (even from the delicate age of 1 or 2 years old). Too many times they are treated like they are evil (or ignorant) without ever being given a chance to prove otherwise. If they feel like you already think this about them, then there’s no reason for them to act otherwise. To them, the rest of the world must feel that same way about them. When given rules to follow, choices to make, consequences if the wrong choices are made, and a good example to follow to make the right ones, they will work hard to meet the expectations given. Teenagers, more than anything else in the world, just want to be loved and accepted for who they are. They want you to be proud of them, they want to make you happy, and they want to be recognized for their abilities, talents, and accomplishments. They want to be good people, but they must be given the chance to do so. By treating them with respect, answering their many questions, giving them reasoning behind the decisions you’re making, and being a consistent source of love, encouragement, and faith in them, you are on your way to having the kind of relationship with your teenagers that you are looking for. They want to understand your way of life and why you’ve made the decision you have. They are not challenging you but really trying to understand. Even if they are challenging you, they are still just trying to understand in the best way they know how. Most likely they want to know how you handled it, so they can do the same thing in their lives. They want to know what you went through, so they can learn from your lessons. Most teenagers won’t just come out and say “I need your help.” How many adults do you know that can? In fact, to teach them how to do this, you will have to be just as willing to show your weakness to them as you are asking them to do for you. I’m not saying that you should be crying on their shoulders, because that wouldn’t be appropriate. But they do need to know that you are a human being and that you make mistakes as well. All of this crazy talking and feeling is likely to make your head spin and put you in a very uncomfortable place. Now you know how your kids feel. By being this person with your teenagers, you are not only teaching them to communicate, but teaching them to understand their feelings, handle their issues in a better way, make the right decisions, and become a much more well-rounded human being (one that will be closer to you). Too many parents think that the answer to gaining the trust of their teenagers, getting to hear their thoughts and the inner workings of their lives, and maintaining the close relationship they’ve always had with their children, that they have to be their best friend; go partying with them, talk like them, dress like them, hang out with them, and let them do whatever they ask just to keep them happy. Unfortunately, this will have the exact opposite effect that these parents desire. Teenagers do want structure. They want rules and consequences, and they want someone they respect to show them the right way. All that is happening by being their “best friends” is a developing lack of respect and resentment that what they needed the most was stolen from them. Being a friend to your teenagers is great, as long as is comes with boundaries. They must always know that you are still the parent, simply meaning that it is your responsibility to look after them, show them the right way, and keep them safe. This doesn’t mean yelling, screaming and punishing. This really means that sometimes you have to be tough when you want to be fun. However, in the end, this way you’ll be an even better friend, and gain a great respect from your children as a parent. Teenagers will push and try to bend the rules at times. This is just what children do. It is natural, normal and healthy. They are trying to find your limits to know how far they can really go, which is why it’s so important to be consistent. Give them your rules (maybe you come up with appropriate rules together), and set the consequences if those rules are not followed. Give them choices so they have the freedom and the responsibility given to them to make the right one. Let them know what happens with each choice nonchalantly. I say this because anything done in anger will not register with your kids. Consequences should make sense and not be set when you’re angry either. Consequences are just a fact of life. If I don’t wake up and write my essay for me, I don’t make money. If I don’t pay my bills, they shut off my utilities. If they don’t get their homework done, they get zeros on their work. If they let their grades fall, they don’t get to participate in sports/go to parties/go on that trip they want to take. If they don’t come home on time, they don’t get to go out next time. If they misuse their cell phones, they lose them. Let the consequences be natural. “You didn’t come home on time. You know what the consequences are. You make your own choices.” They’ll quickly learn that their choices actually mean something, and will begin making the right ones for their own benefit. But you have to be consistent for this to work. If you set rules today, they must remain tomorrow and the next day. Obviously rules may need adjustment as your kids grow and mature, but this can be remedied with a little of the communication we discussed before. They will want to know why the rules are changing, and know that you still have the same expectations from them. Kids just want to know that you love them, and they want to understand what’s happening around them. By giving them the respect you expect from them, by actually talking to them and opening yourself to them, by setting boundaries and being consistent with your rules, you develop a two-way trust with them. They will trust that you will always love them and be there for them. They will trust that they can talk to you, and will actually be heard and understood. They will know that they are cared for and that they have a stable, strong household to come home to for shelter and reprieve. And they won’t want to break your trust. And you must give them your trust. Granted, sometimes they will make the wrong decisions, but you have natural consequences in place to show them the right path. This doesn’t mean that they aren’t trustworthy, but that they are human, just like you. In fact, when you admit to your own mistakes, like we discussed above, and ask for forgiveness from them, they will begin doing the same for you. What’s even better is that you will see this trust only increase on both sides. As they get older, they have to start learning many of these lessons on their own. However, by you showing them that you believe they are responsible, can make their own decisions, and accept them for who they are, the choices they make, and the direction they choose in life, they will be trustworthy just to make sure they meet your expectations and make you proud. Communicating with your teenagers is not as hard as it sounds. They are not ignorant children, they are not alien life forms (although they may look that way sometimes), and most of all, they are not evil in any way. Teenagers are a product of their environments. When you give them what they need most, simply by treating them like your wonderful children, they will live up to your beliefs and be your wonderful children. Although teenagers can be difficult at times, so can anyone. I think the stereotypes of teenagers tend to guide a lot of parents in their words, their beliefs, and their actions, destroying any chance of communication there might have ever been between parent and teenager. Just talk to them, tell them your worries for them, and express your love for them. It’s likely they are feeling the same way. Don’t be scared of them. They are just human beings that want to know that they are safe and loved in your arms. Treat them this way, and you’ll reap the rewards of a magnificent relationship with your children.